The Hitachi brain-machine interface unit has, I believe, already been covered in the pages of Technovelgy (see Hitachi Brain Scanner Fun Toy). However, there are new pictures of more up-to-date prototypes - as well as more suggestions in how they might be used. Optical topography is the secret; infrared light is sent through to the brain's surface to map out changes in blood flow. If this can be done on a controlled basis by the user, you now have a usable controller. For example, intrepid Hitachi researchers have succeeded in running a model train by performing mental simple calculations; when you stop calculating in your head, the train stops too. 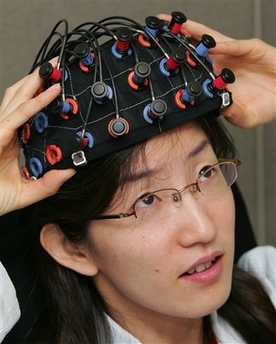 Hitachi intends to exert it's brand power on couch potatoes; a brain-machine interface TV remote-control is in the works. Now, you'll have to explain the joke when someone is shown using a remote control as "exercise." Regular technovelgy reader Zac wants to do more; he wants to have a working weirding module from the movie made from Frank Herbert's novel Dune that will translate mere thought into a devastating beam of energy. At first, I had no idea what the weirding module was - until helpful Wikipedia reminded me. 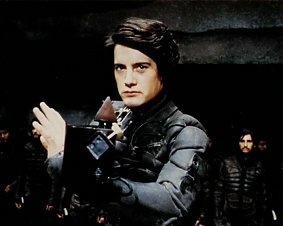 In the film, director David Lynch decided to have a special device that would turn Fremen leader's spoken name "Muad'Dib" into a weapon. This device does not appear in the book; Dune purists disdain it. A picture of it is provided below. However, I'll bet that if DARPA would cough up several million in development dollars, brain-machine interface thought energy weapons (BMI-TEWs) might someday become a reality. Via Yahoo news (circuitously) - thanks to Zac for the tip.